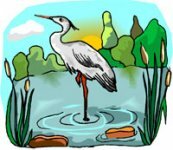 1 What is a wetland? It is not a dry land. It is not a lake. It is some of both! There are four main kinds of wetlands. There are marshes. There are swamps. There are bogs. There are fens. Different kinds of plants and animals live in different kinds of wetlands. 2 Marsh plants are mostly grasses and reeds. A swamp has trees growing in the water. Bogs and fens have lots of moss. All those places are wet! 3 Many things live in wetlands. Fish live in the water. Tiny baby fish hide in the reeds. They live there until they are bigger. 4 In the spring, frogs sing. They lay eggs that become tadpoles. Tadpoles are baby frogs. They hide in the grasses and reeds. Frogs are amphibians. Amphibians are animals that live part of their lives in water and part of their lives on land.